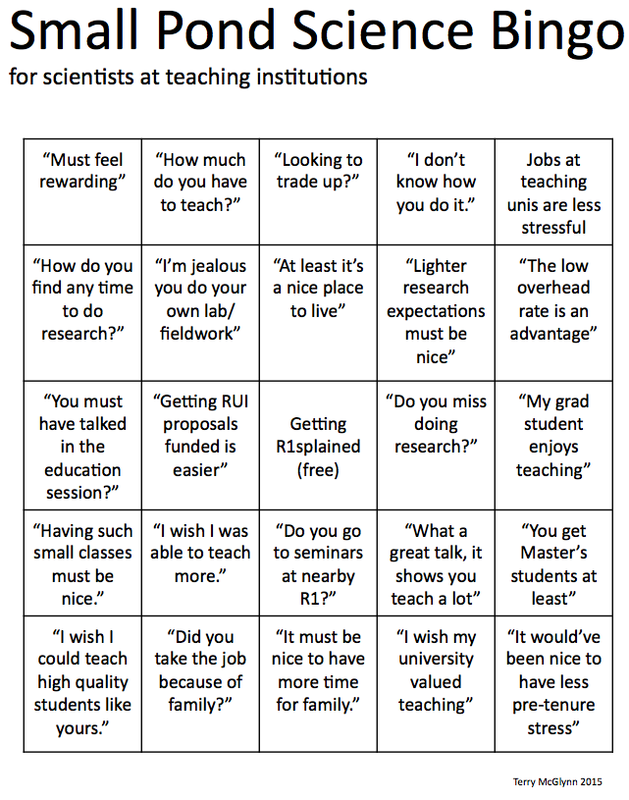 I started this blog back in 201cough because I was fed up with so many people in the broader research community not understanding what happens in teaching-focused universities. And people who think they have an understanding, but that understanding is filled with stereotypes, bias, and misinformation, driven by a lack of direct personal experience. This entry was tagged community, inclusion, R1 vs non-R1. I’m back from vacation! Anyhoo, a funny thing happens to me every summer. Campus has an eerie quiet. There are plenty of people around, but compared to the academic year, there are relatively few students. So if I’m walking from the parking lot, or buying lunch in the union because I was lazy, I might bump into someone. Because I serve on a semiplethora of committees, I know folks in lots of roles on campus. This entry was tagged R1 vs non-R1, summer research, time management. Let me recreate a conversation I’ve heard (or been involved in) dozens of times over the years. This entry was tagged prestige, R1 vs non-R1, social capital. This entry was tagged diversity, inclusion, R1 vs non-R1, respect, summer research. This entry was tagged happiness, R1 vs non-R1. A lot of federal agencies want to enhance the research environment at primarily undergraduate institutions and minority-serving institutions. Not all efforts hit the mark. This entry was tagged collaboration, grants, R1 vs non-R1, summer research. This one is for the ecologists. There are a lot of people who have made outstanding contributions to the field of ecology — in education, research, outreach, and policy. This entry was tagged awards, Ecological Society of America, Ecology, honors, R1 vs non-R1. This entry was tagged R1 vs non-R1, tenure. At the moment, I’m having an absolutely great time at the Ecological Society of America meeting. I’m learning new science, meeting old friends and a variety of folks who read this site, and formulating plans for my sabbatical that recently started. This entry was tagged diversity, R1 vs non-R1, respect, undergraduate research, underrepresented students, URM students. This entry was tagged grad students, postdoc, R1 vs non-R1, research strategies, sabbatical, writing. As I was avoiding real work and morning traffic, there were a bunch of interesting things on twitter, as usual. Two things stood out. This entry was tagged communication, peer review, R1 vs non-R1, respect, social media, twitter. This entry was tagged bingo card, R1 vs non-R1. Over the past week, I’ve been reading Moneyball, by Michael Lewis. I’m not a baseball person (though I do keep tabs on football soccer). I found Moneyball to be interesting in its own right, but particularly when considering how its lessons may be applied to academic culture. Lewis tells the story of Billy Beane, the manager of a small-budget major league baseball team, who assembled a crew that was better than most big-budget competitors. How did Beane pull this off? This entry was tagged literature, R1 vs non-R1, research strategies.